Over 4,000 children enjoyed colouring in a picture and seeing it transform to an animated GIF. 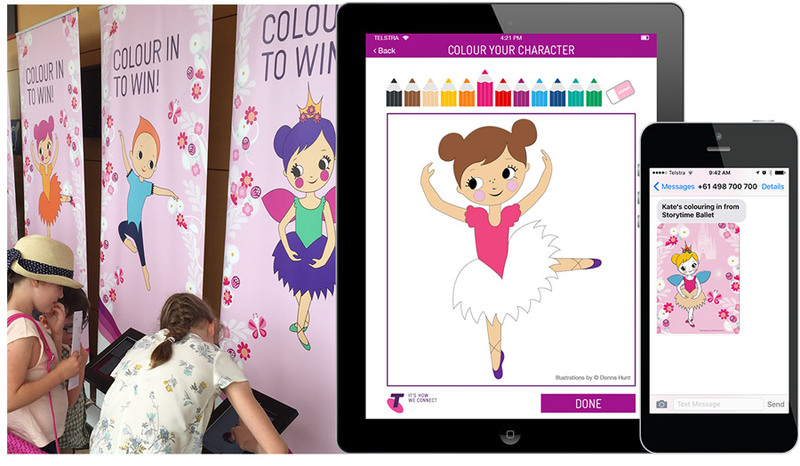 This iOS app travelled the country with the Telstra-sponsored Australian Ballet tour, Storytime Ballet: The Sleeping Beauty, engaging children pre-curtain call and during intermission. Children could select their favourite Storytime ballet character and colour them in using a palette of digital crayons. After saving their colouring in, their work of art was then transformed into an animated GIF, placing their character in an animated background of dancing flowers and a sparkling castle. The animated GIF was MMS’d to their parent or guardian, along with an email including an A4 PDF attachment, so their dazzling design could be printed and put on display. Looking for a fun way to capture data and generate leads?